The framework for protest movements needs to be expanded with a view to threatening the Establishment that supersedes political parties. This “Establishment” is globally-oriented, it erases nation-state sovereignties, and imposes its dark will on all of us, through lies and deceptions. Protest movements also must be globally oriented, and we must challenge the “forbidden truths”. The globalized permanent war agenda and the West’s support for terrorism are two foundational “forbidden truths” that protest movements must address. Recently, Western-supported al Qaeda affiliated terrorists slaughtered innocent civilians in Damascus Syria. These terrorists have been attacking schools, hospitals, innocent civilians, Syrian infrastructure and all of Syria for almost seven years now. 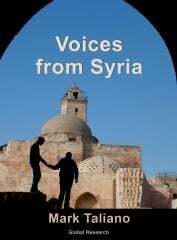 In Damascus alone they have murdered thousands of civilians since the war started. And yet the West, including Canada, still supports them, and illegal terror sanctions, as part of their illegal Regime Change war on Syria. Calling certain terrorists “moderates” is an intelligence agency construct, a psychological operation, that has worked too well for too long to confuse the masses and politicians into supporting Al-Qaeda and ISIS. 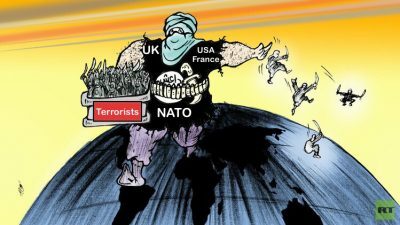 To be clear: All of the terrorists in Syria are Western-supported terrorists. “Moderates” never existed, except as an imperial strategy of deception. We need to challenge the globalized Establishment and its toxic agenda of war, death, and poverty – all protected behind a matrix of interlocking agencies of deception. Canada’s progressive veneer needs to be shattered. Canada is not progressive or civilized or humanitarian. We support terrorism, lie about it, and pretend that we are civilized with our Pride parades, our pink hats, and our oh so cute Prime Minister. The fact that we hide our barbarism beneath these “Establishment-friendly” facades makes us even more disgusting. Human-rights marches must include the human rights of people such as the young lady pictured above, and the children dying unnecessarily in Syrian hospitals, and every person murdered by Western-supported terrorists. AfraaDagher, “Ghouta ‘Moderates’ Slaughter 9 in Damascus Neighborhood.” Syria News. 23 January, 2018. (http://www.syrianews.cc/ghouta-moderates-slaughter-damascus/) Accessed 23 January, 2018. Pierre Le Corf, Global Facebook commentary, 22 January, 2018. Mark Taliano, “Imperial Disaster.” Global Research. 19 January, 2018.(https://www.globalresearch.ca/imperial-disaster/5626548). Accessed 23 January, 2018.